There is a reason there aren’t many restaurant guides for Seoul. To paraphrase a famous hitchhiker’s guide, Seoul… is big. Really big. You just won’t believe how vastly hugely mindbogglingly big it is. It is impossible for one person with one stomach and a limited budget to cover this vast city. This is also a volatile restaurant market. Seoul has one of the highest restaurants per capita in the world. Competition is deadly. By the time a restaurant guide goes to print, some restaurants are gone. A year after publication, and over thirty percent are gone. This guide remedies that. 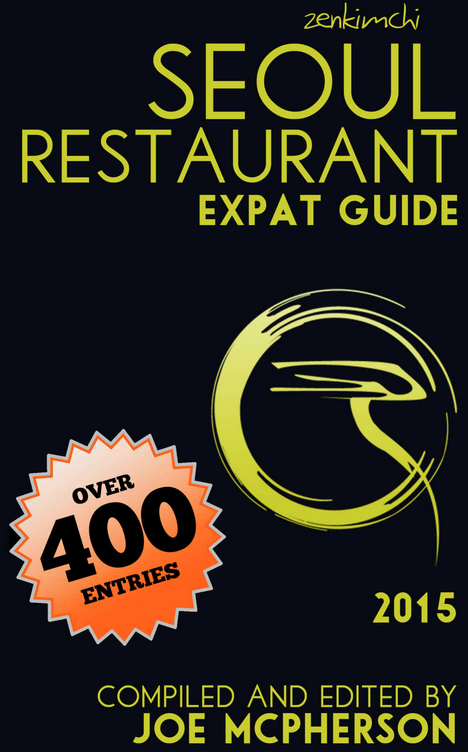 As an e-book, The Seoul Restaurant Expat Guide 2015 is regularly updated all through early 2016, when the new edition will be released. No more outdated restaurant info. You have the latest and greatest restaurants on your Kindle. This book comes from a source of frustration. For a city of its size, Seoul is surprisingly skimpy on international restaurants. That is quickly changing. With more Koreans traveling and living overseas and with more visitors coming to and living in Korea, there is a higher demand for better quality, more authentic international restaurants. Too many times bad restaurants get featured in government travel brochures, Korean TV, and from recommendations from Korean acquaintances trying to impress. Yet that’s the trouble. They are so eager to impress that they don’t think about what international diners actually want. They recommend famous restaurants that are famous for only being famous, though their food is bland. They recommend high end restaurants that impress more with the high price than with the quality of the meal. They recommend restaurants that are all gimmicks with no substance. At the same time, amazing Korean restaurants and authentic international restaurants get ignored. This guide cuts through the bull. The restaurants included come from ZenKimchi, Korea’s longest running food blog, and are crowd-sourced from the active foodie community in Seoul. Included are not only reviews but real comments. Candid comments. Unfiltered, though edited for legibility. Those can be the most informative and the most entertaining, especially the haiku reviews. The guide’s content comes from passionate expats and English speaking Koreans living in the Seoul metropolitan area. They know the city intimately. It’s real Seoul food. These are not only the best international restaurants but also the insider scoops on authentic Korean restaurants that will make your friends envious at home. For the foodie traveler, this is your essential Seoul travel guide. This entry was posted in Books about Korea, Tourism and sights by admin. Bookmark the permalink.